The author of this article, Viktor Sostak is a specialist on Carpatho-Rusyn folk instruments and a curator at the Uzhhorod Historical Museum. This article is the conclusion of a series on folk instruments and was translated by Margarita S. Mikhalyova and Jerry Jumba. - Editor. 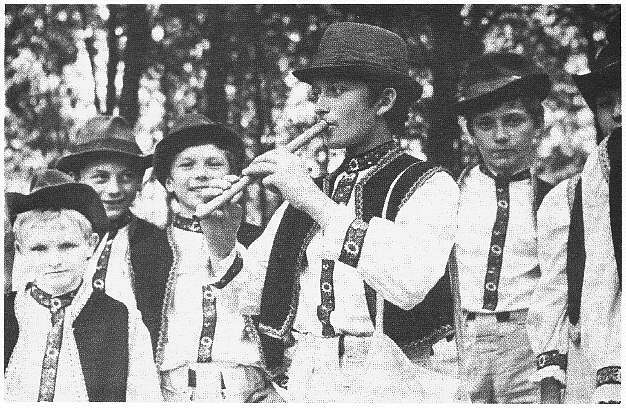 A young boy from the village of Klenova in Zemplyn county playing the sopilka. Did you hear how a sopilka plays? If not, you can hear this in Transcarpathia. Go where the bright colors and wonderful sounds create a musical magic all their own. Among the rustling of the pines and gurgling of mountain streams, many musicians are born. Under sensitive fingers, not only violins, cymbali, and trembity play, but the leaf of the periwinkle and the skin of an ordinary fish also have a musical life in the musician's hands. But certainly the most unusual voice is that of the sopilka. Oj chto toto v polonyni hraje na sopilci? To mij ljubko soloden'kij dozyraje vivci. Jak zahrajut', zascebecut to moja uticha. Veselen'ko zaspivaju, v sopilku poduju. Spivanocok dosta znaju, rota ne Skoduju. Oh, who plays the sopilka on the high meadowland? It is my sweet boyfriend who is watching over the sheep. How they play like birds, chirping for my enjoyment. I know many songs and will not wear out my lips. In a sincere way and with great love the Rusyn people sing about this expressive instrument which they call the pyscalka, dudka, or sopilka. The sound of the sopilka depends on the strength of the wind flowing through the opening. 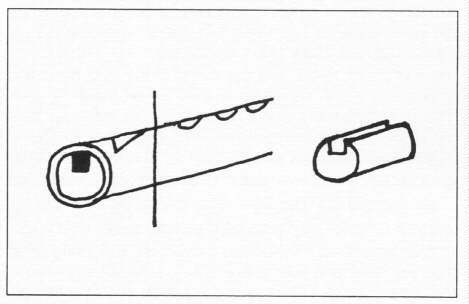 The upper section, called the dence, or svistok, meaning "whistle", contains and inserted piece of wood called the copyk. In the dence, the friction of the air column against the copyk speeds the air to create the necessary vibration that will resonate in the body of the sopilka and give us the sopilka sound. In Subcarpathian Rus', there were two kinds of sopilky - one with and one without the whistle mechanism. The type of sopilka containing the whistle mechanism is sometimes referred to as the dencivka. It is made of elder wood. It should be mentioned that in the Hutsul, Bojko, and Verchovyna regions of Transcarpathia, all sopilky and dencivky are called pyscalky from pyscaty (to peep). The pitch of the sopilka's sound depends on the length and width of the pipe. The longer and wider pipe has the lower sound, the short and thin pipe has the higher sound. With the help of six uncovered holes made with a hot iron or a carving knife, a player produces different pitches. If you want to make a fine-sounding sopilka, it is a complicated process. It is important to select the proper wood with a sturdy, even structure that has a regular distance between the tree's growth rings. In order to have sopilky for a folk orchestra, you must make the instruments alike to play in tune with one another. It is difficult to find perfectly matched pieces of wood. The sopilka maker must carve and drill precise measurements into like pieces of wood. For this reason, a sopilka that is made without the whistle mechanism is used by most folk orchestras in Subcarpathian Rus'. It is known as the sopilka bezdencivka. Because it has no whistle mechanism the proper sounding of this instrument demands special training and constant attention from the performer. In the hands of a good musician, it will make a fine sound. In the Verchovyna, the mountainous central area, one can find the skosivka. The skosivka has a diagonal mouthpiece that is cut at approximately a 45' angle, with no finger holes on the body. With the help of the fingers at the bottom of the pipe one can change the pitch. The more open the hole at the bottom, the lower the pitch will be. The finger covers the hole at 1/4. 1/3 and 1/2 its size. The length of the sopilka is usually 60 centimeters. Two very interesting sopilky of the bezdencivka type are the flojara and the frylka. These are very popular among the Hutsuls of Transcarpathia. ta zahudu ta zahraju v vivcars'ku flojaru. Na flojari, na sopilci i na trembiti znaje. and I play my shepherd's flojara. how to play the flojara, sopilka and even the trembita? The length of the flojara is one meter (about 39 inches). One can change its sound with the help of six holes on its body. In addition, the performer gives a specific color to the flojara sound by humming a bass pitch that resonates in the chest. The flojara is a solo instrument, and is sometimes called the Dido's Flojara (grandfather's flojara) because of its quiet nature. The frylka, like the flojara, has six holes and no whistle mechanism. The mouthpiece tip is cut in a shape similar to the top of a volcano. One can produce a diatonic scale and play loudly or softly. Frylky are used in ensembles and play the main melody along with the violins. The musicians classify the frylka according to the instrument it will accompany. There is the frylka for violin. It is 20 centimeters long and sounds like a piccolo. The frylka for cymbaly is 30 centimeters long and sounds like the upper register of the flute. The holyhonka is 40 centimeters and sounds like the middle register of the flute. The dvodencivka, the kuvycja, and the telynka. The dvodencivka, or dzurun'kalka is the carving of two dencivky from one piece of wood. It is rectangular in shape and one side has a row of six holes, the other side has no holes. It will drone a constant pitch while the six-holed side is active with a melody. The kuvycja - so called because it imitates the cuckoo - is known to us as the Pan pipes. It consists of eight to ten short pipes of different lengths from the largest to the shortest. They are tied together or glued with sap or resin. A few of these are made entirely of one piece of wood. With the help of a mouthpiece having the dence and the copyk, a diatonic scale from do to do can be produced. In the Verchovyna region, one can still find the telynka. It is 70 centimeters in length and has a mouthpiece but no finger holes. One can change the pitch with the index finger closing the bottom hole at 1/4, 1/2, or 1/3 its size. This is a solo instrument that does not play loudly. Na sopilci lys zahraju, obizvutsja hory. Teper vilna Verchovyna i zyrtja zamozne. Chaj na viky mir i druzba kripne mezy namy. Oh when I drive my sheep to pasture in the green forest. I play my sopilka, and the mountains answer it. Now the Verchovyna is free and our life is full. Let there forever be peace and friendship among us all.